Blue Ocean Megaphone, manufactured by Nielsen-Kellerman, named exclusive megaphone brand at the world’s largest two-day rowing event, celebrating its 50th anniversary this year. I’ve struggled to hear the referees as I’ve bounced around in the Basin more than once, and I know our Blue Ocean Megaphone will make a real difference. I’m glad NK can make a meaningful contribution to such an iconic competition. Nielsen-Kellerman announced today that its Blue Ocean® Rugged Megaphone has been named the official megaphone of the prestigious Head Of The Charles® Regatta held October 18-19, 2014. 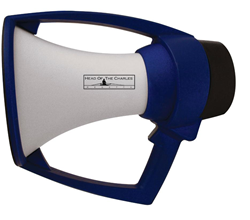 The Blue Ocean Megaphone will be used by regatta officials, volunteers and event organizers throughout the two-day rowing competition and was selected based on its rugged reliability, crystal clear sound projection and extreme range. The 2014 Head Of The Charles Regatta expects to host more than 11,000 athletes racing in 55 different events over two full days, watched by 400,000 spectators massed along the banks of the Charles River in downtown Boston. From getting boats to the starting line in the correct order and keeping them safely on course to spectator crowd control, clear voice projection is a critical safety and organizational requirement for this enormous event. “We are so pleased that the world’s best-built megaphone will help ensure the success of the world’s biggest rowing event. As the premier supplier of amplification and timing systems for rowing, NK has been an exhibiting vendor with the Head Of The Charles for over 25 years. Many NK employees have competed in the race over the years as well. In fact, I’ve struggled to hear the referees as I’ve bounced around in the Basin more than once, and I know our Blue Ocean Megaphone will make a real difference. I’m glad NK can make a meaningful contribution to such an iconic competition,” said NK CEO Alix James. The official Head Of The Charles Blue Ocean Megaphone features a Head Of The Charles logo printed on the cone in honor of the event’s 50th anniversary and can be purchased at the NK tent at the regatta itself or for a limited time at http://www.blueoceanaudio.com. The Blue Ocean Megaphone is waterproof and built to be comfortable to hold and able to withstand drops without breaking. It projects exceptionally loud, clear sound with its high-efficiency amplifier and industry-leading Speech Transmission Index. Blue is green too ̶ the high-capacity rechargeable battery pack greatly reduces cost of operation and environmental impact in comparison to the dozens of disposable batteries consumed by most megaphones. The Blue Ocean Megaphone has been adopted by first responders, Navy SEALs, race organizers, coaches and many others who require a megaphone they can count on in any conditions. For more than 35 years, NK has been known worldwide for its waterproof speed measurement, timing and audio systems for competitive rowers and other water sport athletes. NK products are designed and built in NK’s award-winning Lean factory in Pennsylvania. For more information, contact Meg Amis at 610.447.1555 x306, mamis(at)nkhome(dot)com or visit http://www.nkhome.com.